Empire Aviation Group (EAG), the Dubai-based private aviation specialist, has announced plans to expand into India with a new Mumbai branch office opening by mid 2011. The company aims to replicate its success in the Middle East, where EAG manages one of the region`s largest managed fleets of business jets and which continues to grow with the addition of Dassault Falcon 7X jets. The senior management team from EAG will attend EBACE 2011 as the company looks to develop its regional position and accelerate its expansion within and beyond the Middle East. EAG`s new branch in Mumbai - the company`s first operation outside Dubai - will eventually offer the full range of Empire Aviation Group services in the subcontinent, and will have an initial focus on aircraft sales and management. The expansion into India comes as the Middle East market shows increasing levels of confidence and activity - and where EAG has just added two Falcon 7Xs to its managed fleet with a third set to join the growing fleet of more than 20 aircraft, based at Dubai International Airport. The Falcon 7X offers 15-30% greater fuel efficiency than other aircraft in the large cabin, long range class. The range of 5,950 nm means the aircraft can comfortably connect 95% of the commonly used business aviation city pairs worldwide, such as Beijing-Paris, New York-Riyadh. It can also connect Shanghai with Auckland and Seattle with London City Airport. Paras Dhamecha, Executive Director at Empire Aviation Group, stressed the importance of timing in announcing the move into India: "Business jet registrations in India have risen strongly in recent years and there is an attractive market opportunity especially for our aircraft management services, and good potential for aircraft sales. Our home market in the Middle East is also building momentum as confidence and activity levels return. Our clear aim in India is to emulate the success we have achieved in the Middle East, where we have become one of the region`s largest specialists since starting operations in 2007. It`s a very exciting time for our young company." 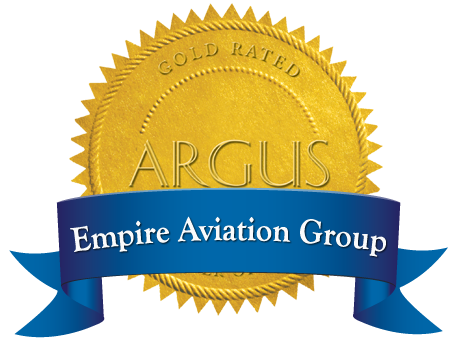 Operating from Dubai International Airport, Empire Aviation Group focuses on a highly distinctive asset management approach to private aviation which combines substantial private aviation experience and expertise with a commitment to 5-star customer service for managed aircraft owners and charter clients. Since the start of 2011, EAG has begun managing the Middle East`s first dedicated air ambulance service and announced a tie-in with Taj Hotels to offer jet inclusive luxury charter packages through its Lifestyle@Empire division. "We are confident that our business model will continue to support aircraft owners in achieving their financial and travel objectives and so we are confident about the future prospects for the industry in the region," adds Paras Dhamecha. "This follows an encouraging year in 2010 when the charter market was more active. Our charter operations performed well in the second half of 2010, with an up-swing in the executive charter market and we have also seen a substantial increase in jet charters for business clients flying into emerging markets such as Iraq and Afghanistan. There was also some improvement in aircraft sales. Global aircraft sales - and especially the US market - are still depressed but we see this as a temporary situation and the demand from the emerging markets such as India, will continue to develop strongly." Paras concluded.